Nicolas Léonard Sadi Carnot (June 1, 1796 – August 24, 1832) was a French physicist and military engineer whose formulation of the laws on the theoretical efficiency of heat engines paved the way for the establishment of the field of thermodynamics. Although Carnot operated outside the mainstream of the scientific community, he made a major contribution to his field. Born in Paris, Sadi Carnot was the son of the eminent military leader and geometer, Lazare Nicholas Marguerite Carnot, brother of Hippolyte Carnot, and uncle of Marie François Sadi Carnot. His father named him for the Persian poet Sadi of Shiraz, after a son by the same name died before Carnot was born. Carnot's father was an important personage in both science and politics. He was one of five directors who led France beginning in 1796 in the wake of the reign of terror. In 1797, when a military coup deposed the directors, Carnot's father left Paris for Switzerland and Carnot went with his mother to St. Omer. Political upheavals in France thus rocked Carnot's childhood, and it is said that they contributed to his physical frailty. Carnot's father returned to France after two years in exile, and was appointed minister of war under Napoleon. During this time, Carnot spent time with, and was considered a favorite of, Napoleon's wife, Josephine, whenever his father was called to visit Napoleon. In his childhood, Carnot is said to have taken a deep interest in the working of machinery, and he once wandered off to visited a mill to inquire about how the milling mechanisms worked. This early interest dovetailed with his father's, and the latter provided Carnot with an excellent technical education. Carnot attended the Charlemagne Lycee, and in 1812, at the age of 16, he was admitted to the École Polytechnique where he and his contemporaries, Claude-Louis Navier and Gaspard-Gustave Coriolis, were taught by professors such as Joseph Louis Gay-Lussac, Siméon Denis Poisson and André-Marie Ampère. After graduation in 1814, he became an officer in the French army. In that year, he participated in military engagements in Vincennes. By that time, Carnot's father had become a general in Napoleon's army. 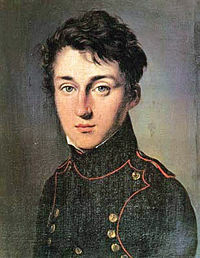 Carnot attended the military academy at Metz, enrolling as a cadet sub-lieutenant, where he is said to have engaged in some scientific writing. When the Bourbon Monarchy took final control of France in 1815, Carnot's father was exiled. Having an infamous father made career moves on Carnot's part difficult. Carnot took on menial jobs in the military, such as working on construction projects. He sought a promotion, and was appointed lieutenant in 1819. The new post gave him time to pursue his many interests, which included scientific research as well as a broad range of cultural activities. He disengaged from active military service, receiving a stipend of half his salary, and moved to Paris. Carnot's father died in exile in 1823. In the meantime, Carnot interacted with figures in the industrial and scientific circles in which he took an interest. He traveled throughout Europe and gathered as much information on the commercial and industrial state of the region as he could. He also attended lectures at the Sorbonne, the College of France, and the Ecole des Mines. On the basis of his experience, and perhaps with the impetus of his father, who had also written on some of the inherent limitations of machines, Carnot published a pamphlet in 1824 in which he investigated the process by which heat engines such as the steam engine produce power. He concluded that there is a maximum efficiency that any sort of heat engine can achieve, and this efficiency is dependent on the high and low temperatures between which the engine operates, but not on the substance, such as air or steam, that produces the motive power. He demonstrated these facts by showing that if they were not true, that it would be possible to create energy from nothing. The importance of his work was difficult to discern at the time. A friend, Pierre-Simon Girard, tried to circulate Carnot's pamphlet, but he failed to generate much interest in it. Some of its contents appeared in Revue Encyclopedique. The poor understanding of heat at the time, even among scientists, was certainly an impediment to the acceptance of Carnot's insightful analysis. In 1826, Carnot was called back to military service, which he undertook for two years with the rank of captain. In 1830, Charles X of France abdicated, and was replaced by Louis-Philippe under a constitutional monarchy. Carnot is said to have favored this development, which was supported by liberal factions of the French population. Around this time, Carnot became a member of the Association Polytechnique, an organization of graduates from the Polytechnic School, with the goal of disseminating scientific and practical knowledge to the general public. He engaged in the study of the characteristics of gases, but published none of his results. In June of 1832, Carnot took ill. He first contracted an inflammation of the lungs, then scarlet fever from which he made some recovery. But he finally contracted cholera, to which he quickly succumbed on August 24, 1832. An examination of Carnot's papers after his death indicates that he had jettisoned the prevailing theory of heat based on caloric, and had begun to explore the possibility of an equivalence of work and heat, the principles of which became evident 10 years after his death. "From some ideas I have formed on the theory of heat," he wrote, "the production of one unit of motive power requires the destruction of 2.70 units of heat" (Caullery 1934, 99). A translation of this quantity to current units would have placed him within 12 percent of current determinations of the equivalence of work and heat accepted today. These notes were preserved by Carnot's brother, Hippolyte, excerpts from which were published in 1871. They include an unambiguous statement regarding the equivalence of heat and work and of the conservation of energy. "Heat is nothing more than motive power, or, in other words, the motion that has changed form. Wherever motive power is produced, there is always production of heat in a quantity precisely proportional to the motive power destroyed. Conversely, where there is destruction of heat, there is production of motive power" (Bejan 1997, 34). The steam engine was a late eighteenth-century invention which had undergone significant improvement during Carnot's lifetime. An understanding of the nature of heat was still lacking, however, as was an understanding of the manner in which heat is transformed into work. The prevalent theory of heat was the caloric theory, which supposed that heat was a sort of weightless, invisible fluid that flowed from a hotter to a cooler body. Engineers of Carnot's time determined that the efficiency of an operating steam engine, the work generated from a given quantity of fuel, such as from burning a lump of coal, was a mere 3 percent. Carnot would show that the maximum achievable efficiency was about 40 percent. Carnot wished to investigate the maximum efficiency possible in a steam engine. He divided the operational stages of a working engine into cycles that the working agent such as steam goes through to generate what he descriptively called motive power. These stages are now referred to as the Carnot cycle, and are the foundation of the study of thermodynamics. Carnot used the steam engine as a guide and as an example, but he made clear that his results applied to engines using air or any other agent. 1. Between two fixed temperatures, there is a maximum motive power that can be achieved. 2. The maximum quantity of motive power does not depend on the substance (such as steam) used as the working principle. 3. The motive power generated depends only on the initial and final temperatures of the bodies between which the heat transfer takes place, and is greater for a greater difference in temperature. 4. The quantity of motive power developed between two temperatures is a maximum when it is achieved through a reversible process. Carnot argued that if there were a way to produce more motive power than through a reversible process, then it would be possible to produce perpetual motion. "Such a creation," Carnot argued, "is entirely contrary to ideas now accepted, to the laws of mechanics and of sound physics. It is inadmissible. We should then conclude that the maximum of motive power resulting from the employment of steam is also the maximum of motive power realizable by any means whatever" (Carnot 1824). Although Carnot showed that the efficiency of a reversible heat engine is a function of the two temperatures of the heat reservoirs between which it operates, he did not give the exact form of the function. Based on some crude assumptions, he did attempt to evaluate the maximum efficiency of a heat engine and compare it to the best steam engines in operation at the time. He concluded that those engines operated at one-twentieth of the maximum possible theoretical efficiency. In the 1840s, scientists such as William Thomson (Lord Kelvin) and James Prescott Joule showed that when mechanical energy is generated from heat, a proportional amount of the heat disappears. The equivalence of work and heat as interconvertible forms of energy became the foundation for what is referred to as the first law of thermodynamics. The understanding of Carnot's discovery, that in order to generate motive power, heat must be transferred from a hotter to a colder body, became the foundation for the second law of thermodynamics. These two principles confused scientists at first, with some supporting Carnot's ideas, while others gravitated to those of Joule and Thomson. Rudolph Clausius finally showed that the two viewpoints were actually two independent principles, both of which were valid and necessary to understand thermodynamics. While it appears that during his lifetime, Carnot's analysis made no great waves in the scientific community, it took only one scientist to appreciate his contribution. This was Émile Clapeyron, who in 1834 published a paper based on Carnot's 1824 pamphlet. Clapeyron's advances were further elaborated upon by Clausius and Kelvin, who together derived from it the notion of entropy and the second law of thermodynamics. Thomson was trying to find a working definition of temperature independent of the phenomena by which temperature was measured, such as the expansion and contraction of solids, liquids, and gases. He used Carnot's ideas to define temperature in terms of the maximum amount of work that can be produced when a heat engine operates between two temperatures. He made the unit for the measurement of temperature equivalent to that of the centigrade scale, but put the zero point for his scale at absolute zero, the temperature at which the volume of an ideal gas is so reduced that it disappears. This is today known as the Kelvin scale. The principle of the conservation of energy and the equivalence of work and heat occurred to many scientists independently, including, if we are to believe in the authenticity of Carnot's posthumously published notes, to Carnot himself. But Carnot's understanding of the dependence of motive power on the transfer of heat from a hotter to a colder body is much more subtle. It is easy to imagine that, without Carnot, the formulation of the second law of thermodynamics would have been much delayed, or necessarily discovered by an entirely different route. Thermodynamics had so many wide-ranging applications after it was more fully developed by Clausius and Thomson, and afterwards in a far more powerful fashion by Willard Gibbs, that it is hard to imagine modern science without it. One may therefore conclude that without Carnot's particular brand of genius, so misunderstood in his lifetime, science would have suffered a substantial setback. Carnot was not a regular contributor of research to the important scientific journals of his time, nor did he hold a teaching position at a university. He can be thought of as outside the mainstream of the scientific community. His lack of such credentials was certainly a stumbling block to the dissemination and recognition of his work. Part of the lack of acceptance of Carnot's work in his lifetime may have been due to his own failure to develop his ideas subsequent to publication. Carnot left important questions unanswered, such as the precise manner in which efficiency of a heat engine depends on the operating temperatures. Although he clearly formulated the problems to be solved, his less than rigorous approach to estimating the very quantities that were crucial to the importance of his work may have slowed the acceptance of his ideas. Bejan, Adrian. 1997. Advanced Engineering Thermodynamics. New York: Wiley. Carnot, M. H. 1943. "The Life of Sadi Carnot." In Carnot, S. Reflections on the Motive Power of Heat and on Machines Fitted to Develop This Power. Tr. R. H. Thurston. New York: American Society of Mechanical Engineers. Caullery, Maurice. 1934. French Science and Its Principal Discoveries Since the Seventeenth Century. Manchester, NH: Ayer Company Publishers, pp. 96-99. ISBN 0405065841. Morus, Iwan Rhys. 2005. When Physics Became King. Chicago: University of Chicago Press, pp. 128-131. ISBN 0226542017. The text of part of an earlier version of this article was taken from the public domain resource A Short Account of the History of Mathematics by W. W. Rouse Ball (4th Edition, 1908). John J. O'Connor and Edmund F. Robertson. Nicolas Léonard Sadi Carnot at the MacTutor archive. An animation of the Carnot cycle as a java applet. History of "Nicolas Léonard Sadi Carnot"
This page was last modified on 3 December 2018, at 17:21.